House Democrats Lose Leading Voice On Defense : It's All Politics Rep. John Murtha, a powerful Pennsylvania Democrat, dies at 77 after complications from gall bladder surgery. 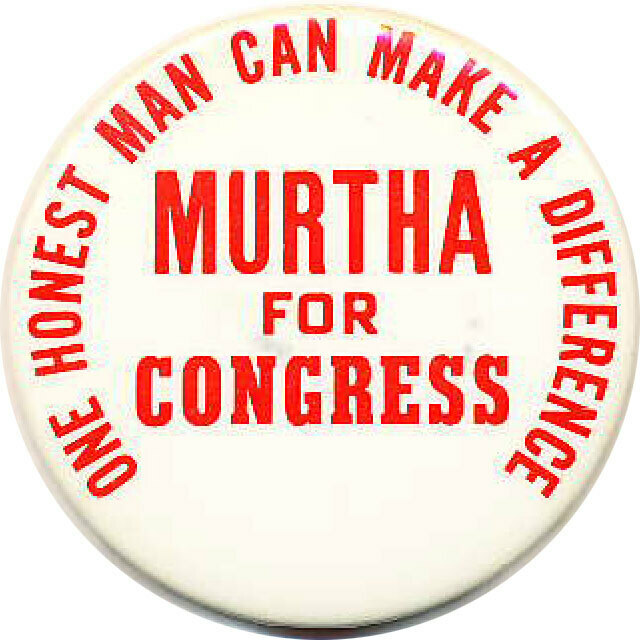 Murtha, running for Congress in 1974, at a time of voter concern over the Watergate scandal, focused on ethics and honesty. Rep. John Murtha, a Pennsylvania Democrat who for decades was one of the most influential members of the House -- and whose own personal ethics have long been scrutinized -- is dead. The 77-year old Murtha had been hospitalized since last week due to complications from gall bladder surgery. Whether Democrats were in the majority or minority, Murtha was one of the body's most powerful lawmakers. Few were as adept as he when it came to pork-barrel politics; his district in southwestern Pennsylvania, centered in Johnstown, was the recipient of billions of dollars in programs, most of it due to his influence. But his personal ethics, dating back to the Abscam scandal in 1980, have always been an issue -- even as he continued to win re-election handily. When Murtha was first elected to Congress in 1974, on his second try, he became the first Vietnam veteran to do so. (He had been awarded a Bronze Star and two Purple Hearts.) Although the election was decided by just 122 votes, he quickly became entrenched in the district. As a member of the Appropriations Committee, he wasted no time in steering money to his district. Murtha attracted national attention in early 1980 when his name surfaced in the investigation of members of Congress who were willing to accept bribes from FBI undercover agents disguised as businessmen and wealthy Arab sheiks. Seven were indicted; the case against the eighth, Murtha, was deemed insufficient to warrant an indictment, though he did appear on tape as seemingly willing to introduce private immigration legislation to help an Arab businessman. But unlike the others, Murtha accepted no money. Except for the 1980 election, Murtha never attracted less than 60 percent of the vote. That is, until his last campaign, in 2008. In a year when Barack Obama was the Democrats' presidential nominee, Murtha called the residents of his district "racist" and "really redneck." The Republican nominee, retired Army lieutenant colonel William Russell, held Murtha to 58 percent. Murtha was also on the defensive in early 2009, following a government raid on the offices of The PMA Group, which had close ties to the congressman and which was questioned about alleged illegal contributions to (and questionable earmark projects by) Murtha. Murtha never apologized for anything and was never charged with any wrongdoing. In March of 2009, he told the Pittsburgh Post-Gazette, "If I'm corrupt, it's because I take care of my district. . . . Every president would like to have all the power and not have Congress change anything. But we're closest to the people." Part of his popularity was his gruff, tell-it-like-it-is style. For the longest time, as chairman of the Appropriations subcommittee that controled military spending, he was a strong supporter of the Pentagon. He was a solid backer of the 2002 resolution authorizing President Bush's invasion of Iraq. But he dramatically broke with the president, and his war policy, in 2005, blasting the conduct of the war and becoming, surprisingly, a hero on the left. Personally close with House Speaker Nancy Pelosi, he had her quiet backing in 2007 when he sought the post of majority leader. But he lost out to Maryland's Steny Hoyer. Just last Saturday, he became the longest serving House Democrat from Pennsylvania in the commonwealth's history. Here is my 2005 profile of Murtha, shortly after he made headlines by calling for a withdrawal of U.S. troops from Iraq. Memorable quote from that piece: In 2004, when Murtha first began to question the conduct of the war, Republicans in the House harshly criticized him. Then-Majority Leader Tom DeLay called Murtha's remarks a "calculated, craven political stunt." Unbowed, Murtha fired back at the former pest exterminator: "When I was in Vietnam, you were killing bugs."